Going along with their other IFA announcements and taking more than a few elements from the Transformer tablets, up next from ASUS is the Transformer Book Trio. The idea is pretty simple: take all the stuff that people like with the Transformer, and pair it up with a full Windows platform. In the process, the display gets bumped to 11.6” and you add Windows 8 as a second OS option (with the ability to switch between Windows 8 and Android 4.2 at the press of a button). If you’re not ready to abandon Windows yet but want a tablet and laptop hybrid device, the Transformer Book Trio may be just what you’re after. 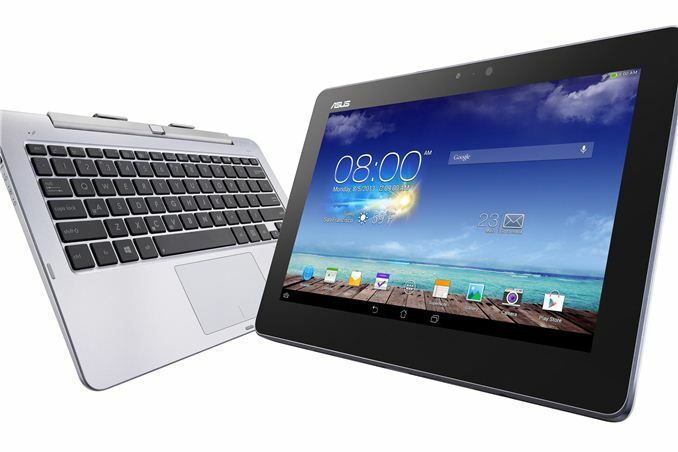 To support the two OSes, rather than relying on what many feel is an underpowered SoC, ASUS equips the Trio with two CPUs: for Windows 8 there’s a 4th Generation Intel Core CPU (up to Core i7), while the Android side gets an Atom Z2760 (1.6GHz). The Android CPU resides in the tablet, so when undocked you only get the Android experience, while the keyboard dock houses the CPU and additional RAM, storage, etc. The display is a 1080p 11.6” IPS panel with 10-point capacitive multitouch, and it has the typical 5MP rear-facing and 720p front-facing cameras. The tablet half of the Trio comes with 2GB LP DDR2-1066 RAM and 16/32/64GB onboard storage. It also includes 2.4GHz WiFi, Bluetooth 3.0, micro-USB 2.0, a 3.5mm headphone/microphone jack, and a microSD slot. Those specs are relatively tame, but ASUS makes up for some disappointments on the PC dock side of things. The PC Station includes 4GB DDR3-1600 RAM and up to a 1TB HDD, with dual-band 802.11ac WiFi, Bluetooth 4.0, 2 x USB 3.0 ports, mini-DisplayPort, micro-HDMI 1.4, and a second 3.5mm headphone/microphone plug. The tablet includes a 19Wh lithium polymer battery while the dock houses a 33Wh lithium polymer battery. Not surprisingly, which OS you run will have a pretty big impact on battery life. 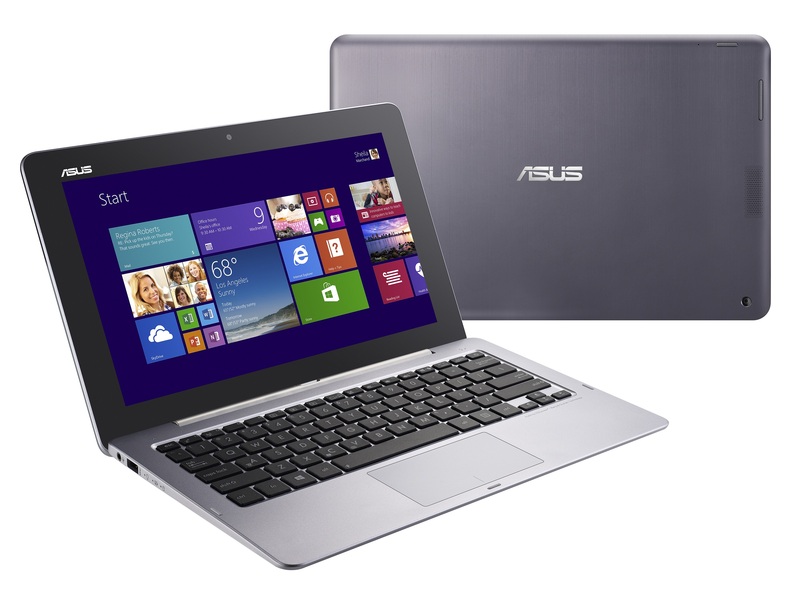 ASUS rates the expected battery life for the Trio at up to 13 hours in Android mode and up to 5 hours in Windows 8 mode. With the added performance and larger size, the Trio isn’t quite as svelte as the TF701T. The tablet measures 304.9mm x 193.8xmm x 9.7mm and weighs 700g, so quite a bit more than the TF701T. The PC Station measures 304.9mm x 193.8xmm x 13.4mm and weighs 1kg. Combined then we’re looking at a laptop hybrid that’s a bit thicker than an Ultrabook and weighs as much as most 13.3” Ultrabooks, but it has a lot of extra functionality to help compensate. ASUS hasn’t finalized pricing or availability yet, so stay tuned. Except to do that with any sense of speed, the tablet part has to be a thick heavy plank like all the other windows tablets (relative to android). I'd like dual boot on the tablet too, and *maybe* RT would be the possibility. What I could live with, is a 'terminal services' type session where the base streams over Wifi to the tablet. sure I still have to bring the base to have windows, but it can stay in the bag and the tablet can run either os (sort of). If you leave the base at home, then your're android only.